Get x2500 Tickets at maximum! Get x80 Skin Fragments at maximum! Get x400 Emblem Fragments at maximum! 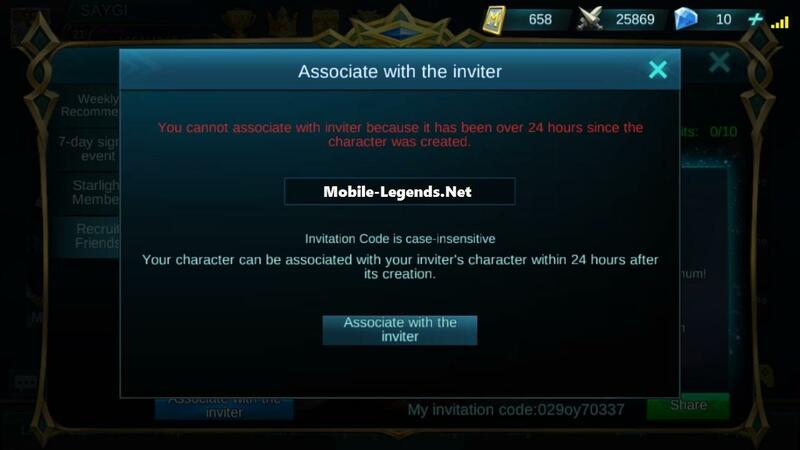 Send the Invitation Code to your friend, and your friend can input the cote within 24 hours after creating a new game account. If your friend doesn’t input the code and associate with you within 24 hours, then he/she will no longer be able to associate with you. Every player can associate with 10 players at maximum. The players can only associate with one of the inviters if invited by multiple players at the same. 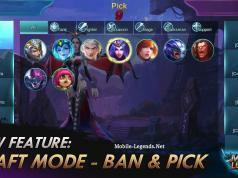 When the players invited by you reach account level 8 and 15, you can claim a prize. Every time when you complete a game together with your invitee, both of you can claim a prize, up to 10 prizes. Your friends who are recruited by you can invite others as well. When they recruit another players and the players reaches level 8, you can also claim a prize. You can still dissociate from the player when you haven’t claimed any prize. 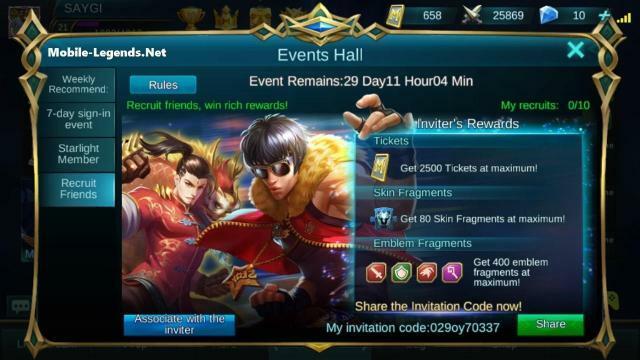 The event lasts a month. When the event ends, there will be a redeem period of 3 days for all players to claim the unlocked prizes. However, you cannot unlock more prizes during this redeem period event though you fulfill the requirements. 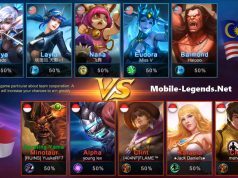 Note: Oww my friend, yes we are the biggest fan website about Mobile Legends! Yes! You can add your invitation code too by commenting. Hey guys ! Please use my code and win big rewards !! I WOLL USE YOURS TOO !! !